At Alan Akana Gallery, take a step back in time and experience the magical splendor of Hawaii's flowers. Located in Koloa, on Kauai's South Shore, the gallery features vibrant floral watercolors that elegantly line the walls of the historic Smith Memorial Parsonage, a fully-restored plantation home built in 1928. The peaceful atmosphere and sophisticated artwork of renowned local artist Alan Akana set this gallery apart. Truly one of Kauai's premiere galleries, experience the art gallery that people are calling a "must-see" for locals and visitors alike. Please click here for more details on planning your visit. Watch our 30-second video for a preview of the gallery! The Smith Memorial Parsonage was built in 1928 in memory and honor of Rev. Dr. James and Melicent Smith, who arrived on this property as medical missionaries in 1842, and their descendants. 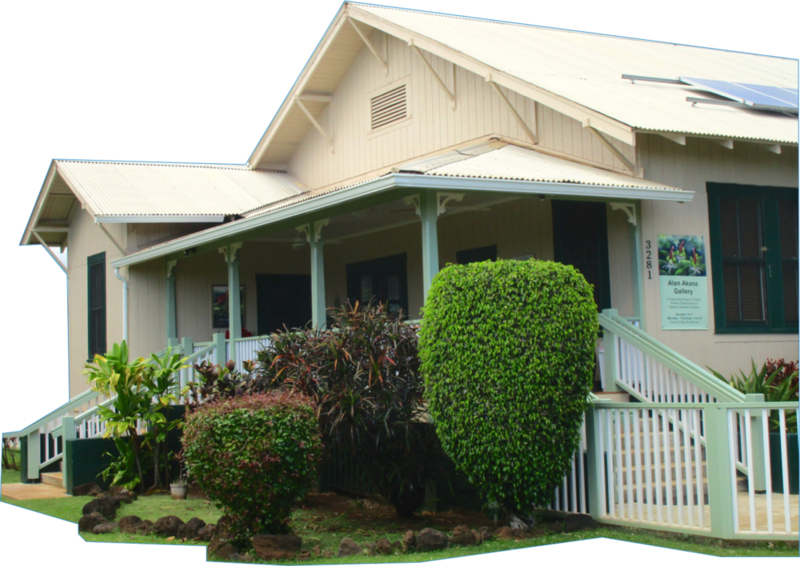 The historic building and grounds are owned and maintained by Koloa Union Church and serve as the residence for the church's kahu (pastor). Proceeds from Alan Akana Gallery support the care and maintenance of the parsonage. Purchases and donations are appreciated! SUNDAY, March 3rd, from 1 - 5 p.m.
You are invited to the gallery to wish him well on his sabbatical, find out more about his plans in Europe, and give him any European travel tips you may have. Refreshments, Door Prizes, Everything on Sale! We respect your privacy. Email addresses are never distributed to third parties. Alan Akana on local TV channel OC16: *Alan has been featured on "The Mokan Nokan Show," a brilliant show that is produced here on Kauai by friend of the gallery, Mel Bell-Grey! Each episode of The Mokan Nokan Show is designed to motivate, educate and inspire children to learn while having fun and Alan was given the opportunity to talk about his book and his artwork on this terrific program. While geared for keiki, it's quite entertaining and educational for all ages. Check it out several days a week on channel OC16! *Go to 17:07 on the video timer to skip ahead to Alan's segment. PBRA wrote an article: "Hawaii's Most Popular Flowers and How to Wear Them". At the end of the article is a recommendation to visit our art gallery in Koloa, inviting guests to check out "vibrant floral watercolors that elegantly line the walls of the historic Smith Memorial Parsonage."